In the order of publishing, Foundation’s Edge represents a return by Asimov to the Foundation novels dating back to 1950. This was the novel in which he officially linked the Robot Novels, Empire Novels, and Foundation Novels together into one universe. I believe it was this choice that helped him to win the Hugo Award for Best Novel in 1983. I liked Foundation’s Edge, but I prefer Foundation and Empire’s “The Mule” or Second Foundation’s “Search by the Foundation” to this book. Actually, while researching the Hugo Award for this novel I found out that according to Wikipedia, The Mule (1946) [part 2 of Foundation and Empire] received one of only three “Retro Hugo” awards. 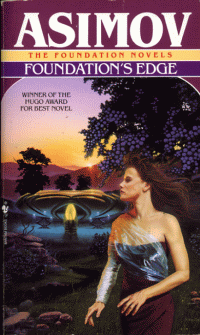 As with most of the other Foundation novels, Foundation’s Edge follows the events of the Foundation (oddly not usually referred to as the First Foundation) and the Second Foundation. The Foundation plot line follows Golan Trevize, a councilman on Terminus, the capital of the Foundation Federation. A Seldon crisis has just passed involving a dispute over whether or not to move the capital of the Foundation Federation to a world closer to the center of the galaxy. Seldon appeared in the time vault and described what had taken place with eerie accuracy. How could Seldon have predicted with such accuracy almost 500 years into the future especially when The Mule had wreaked such havoc to the Plan? Trevize believes that the Second Foundation, and isn’t afraid to bring the issue up on the day that Mayor Branno of Terminus (leader of the entire Foundation Federation) is celebrating her victory, since she had supported keeping the capitol on Terminus. Mayor Branno has Trevize arrested for treason, because his ideas could cause civil unrest. After all, the Foundation is happy to believe that the Second Foundation is defeated, and they are masters of their own destiny. After a short deposition, Trevize is brought to a meeting with Mayor Branno. She mentions in confidence that she DOES believe that the Second Foundation is still around, but that she could not possibly publicly support the notion. Trevize is to be exiled from Terminus with the most advanced Foundation ship available under the guise of escorting a known historian, Janov Pelorat, to Trantor to help uncover Earth. Mayor Branno hopes that Trevize will flush out the Second Foundation and hopes to track them down when they make a move. Back on Trantor, the Second Foundation has another outspoken young leader proclaiming doom. Stor Gendibal, the newest Speaker in the Second Foundation also has noticed that the Plan seems to be going too smoothly. He meets with the Quindor Shandess, First Speaker of the Second Foundation, and convinces him that there must be some outside force helping the plan along besides their own organization. The ramifications of this idea are huge, because the Second Foundation had thought them to be the masters of the upcoming Second Galactic Empire. Speaker Gendibal is convinced that Golan Trevize is being used by this outside force to subvert the Second Foundation in some way. After all, according to their sources, he and the historian are headed to Trantor to consult the Galactic Library in order to find information on Earth. After some political struggling, Speaker Gendibal is sent out to face Trevize. Golan Trevize decides that to search for Earth might actually help him find the Second Foundation after conversing with Janov Pelorat. He feels that the old saying that the Second Foundation is “at the other end of the Galaxy” means “the first inhabited world.” Their cover mission would actually lead them to their true goal. Instead of traveling to Trantor, Trevize intends to research this world called Gaia which could possibly actually be Earth. Unfortunately there isn’t enough information available to give them an exact location or description of the planet. They head to Sayshell, a planet with a very prominent myth involving Gaia. This is rather ironic because Trantor, their original destination, is the true location of the Second Foundation. The rest of the novel involves the convergence of three forces; Golan Trevize and Janov Pelorat, the Foundation, and the Second Foundation. As always, Asimov links them all together at the end and as the pieces fall together you can see the big picture. The main theme in this book is the need to be master of one’s destiny. The Foundation resented being controlled by the Second Foundation. They want to believe that they are fulfilling Seldon’s Plan independently, without the tweaking help and mind control. The Second Foundation is also horrified when they find out that mathematically they could not be 100% responsible for the success of the Plan. This paranoia and aversion to outside control is prevalent throughout the novel. Gaia turns out to be the force feared by the Second Foundation. I’ll leave the nature of the interference for you to find out on your own. Golan Trevize turns out to be a puppet used by Gaia much like Hari Seldon was used by Daneel. He has had a history of always making the “right” decisions, as alluded to by Daneel in Foundation’s Triumph. The caveat here is that he can make decisions based off of incomplete information, but doesn’t always understand why; he essentially just “feels” that a certain decision is “right.” Trevize is as much a product of his environment as Seldon was. In the end, Trevize must make possibly the most important decision in the history of time. I have to applaud Asimov’s writing because during the final pages I actually felt a few tingles go down my spine. This is interesting to me because I’ve read the book before, however many years ago, and already knew what was going to happen. I think this proves that re-reading books can be rewarding.